Have Galatasaray joined Europe's elite following double signing? Having been the headline act of the January transfer window, Galatasaray have no intention of being bashful. "We have added Wesley Sneijder and Didier Drogba to an already very strong team," sporting director Bulent Tulun told BBC Sport. "I think we can go all the way to the end of the Champions League and win it, I really do." The acquisition of Sneijder two weeks ago was a significant signal of intent from the Turkish league leaders. Just three years ago the Dutch playmaker was the fulcrum of an Inter Milan side that won an unprecedented treble and a Netherlands team that reached the World Cup final. Yes, Inter Milan were desperate to offload the player and his massive salary. But Sneijder was under contract at the San Siro until 2015 and did not have to leave, and Liverpool had also expressed interest in him. The fact he chose Galatasaray was a major coup for the Istanbul side. While they identified Sneijder as their main transfer target several months ago, the chance to sign Drogba arrived quite late. With Turkish Football Association rules permitting clubs to have just 10 foreign players on their books, Galatasaray had intended to make Manchester City defender Kolo Toure their final one. Then, shortly before Christmas, Drogba's agent Pierre Frelot called Tulun to tell him Shanghai Shenhua had not been paying their players. "That was when we started talks, but we still didn't know whether we would be able to do a deal," revealed Tulun, who handles all transfer activity for Galatasaray. "Suddenly last week, things got moving. On Sunday, I went to South Africa, to Rustenburg, to the training camp of the Ivory Coast team [who are based there for the Africa Cup of Nations] and we were able to sign the agreement." Galatasaray will now have to wait two weeks for world governing body Fifa to decide whether to sign off the deal, as Shenhua claim Drogba has breached his contract and are refusing to release his registration. Tulun insists he is not worried though, saying he is "100% certain" the deal will go through. Chelsea had also made an offer for the powerful Ivorian, but he chose Galatasaray rather than returning to the club he had inspired to a Champions League triumph last May. Tulun is understandably elated about the signing, describing it as "the most significant in the history of Turkish football". The big question for fans across Europe, though, is why Sneijder and Drogba chose Galatasaray ahead of Premier League suitors. The lure of the Champions League is a major factor. Galatasaray face German side Schalke in the last 16 of the tournament next month and expect to at least reach the quarter-finals. And in Fatih Terim, they have a coach of some repute. The 59-year-old, who has also managed the Turkish national side and AC Milan and Fiorentina, led the club to the greatest triumphs in their history in 2000. That was when a team inspired by Gheorghe Hagi, the "Maradona of the Carpathians", beat Arsenal to win the Uefa Cup before seeing off a star-studded Real Madrid team in the European Super Cup. The current Galatasaray squad already contains some stellar names, such as Brazil international Felipe Melo, Czech defender Tomas Ujfalusi, former Liverpool duo Albert Riera and Milan Baros, ex-Arsenal player Emmanuel Eboue and former Real Madrid and Bayern Munich midfielder Hamit Altintop. And Tulun's recruitment policy has clearly been the opposite of a club such as Liverpool, where investing in youth and potential has been key. Instead, he has sought experienced, ageing internationals capable of making an immediate impact. 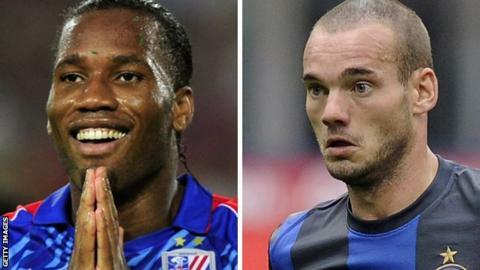 Money, of course, has also been a key factor in enticing Drogba and Sneijder to Istanbul. The Ivory Coast striker will reportedly be paid £8.6m for his 18 months in Turkey, while Sneijder will be on £3.7m-a-season during his three-and-a-half-year contract, according to Turkish media. These salaries will be further sweetened by a top rate of tax for footballers in Turkey of 15%, although there are proposals for this to be raised to 35%. Add in the fact that Istanbul is a historic, bustling city of 20 million inhabitants, and that a burgeoning Turkish league features the likes of Raul Meireles, Hugo Almeida and Dirk Kuyt, and you do have an attractive proposition. So how have Galatasaray managed to afford Sneijder and Drogba? The club came 30th in Deloitte's recent "money league" for the 2011-12 season, with annual revenue of £81.4m. But Unal Aysal, president of the club since May 2011, runs a huge energy and development firm and is worth an estimated £317.3m, making him the 42nd richest man in Turkey, according to Forbes. He has put some of his fortune into the club, while their run to the Champions League knock-out stages has also been lucrative. Two other key - and controversial - factors also boosted Galatasaray's coffers. The club moved from their historic Ali Sami Yen home in the centre of Istanbul to the Turk Telecom Arena on the outskirts of the city in January 2011. This meant swapping an atmospheric, though outdated, stadium with a capacity of 23,477 for a brand-new home with a capacity of 52,652. Cetin Cem Yilmaz, sports editor of the Hurriyet Daily News, explains why the move created controversy. "The Ali Sami Yen Stadium, like most others in Turkey, was owned by the government and leased to Gala," he said. "The government agreed to fund the building of a new stadium, which has hugely increased Gala's matchday revenue. This means it was effectively paid for by taxpayers, many of whom are Fenerbahce or Besiktas fans. "Galatasaray would argue that in return the government got the old stadium, which is in a prime location in the centre of Istanbul and of considerable value." The club also pushed through a complex share issue in 2010, which raised £62.8m for the club. A similar scheme is planned soon. These will help the club when it comes to complying with Uefa's Financial Fair Play regulations. Time will only tell whether this can turn them into a true force in European football.